Anyone can make gorgeous mosaics, no matter what your artistic skill level. By using some imagination and creativity you can create stunning objects or functional pieces for your home. Mosaics allow you to decorate furniture or create totally abstract pieces of art. The basic method for all mosaics is the same, a collection of small pieces are set into grout on a suitable base. Throughout this explanation we shall refer to ‘grout’ and ‘tesserae’. ‘Grout’ is the cement like substance that you use to fill the gaps between the tesserae and make the surface level while strengthening the mosaic at the same time. You can mosaic practically anything that will stand up to the weight of the grout and the tesserae. A good way to start is to buy 1/4 inch hard board that has been sealed for outdoor use, this is very cost effective as a 4x4 feet sheet will only cost about $4.00. If you want to use furniture try going to your local Goodwill shop where you can find many pieces of furniture to transform into exquisite works of mosaic art. 1. Check that the surface you are going to use does not have extreme curves, otherwise the grout will not adhere to the surface. 2. If you are going to use a wood base make sure you score the surfaces to help the grout fix, this is called applying a ‘tooth’ to the surface. 3. Make sure you seal wooden surfaces with a watered down solution of PVA glue, the white general purpose glue you can find at any hardware store. 4. Make sure the adhesive you have will work with the combination of tesserae substance and base substance. 5. Clean the surface thoroughly so the grout can catch. You can go to your local hobby store and buy pre-made square tesserae made from glass or ceramics. A cheaper way is to purchase bulk quantities from a wholesaler online. Another method is to use old broken plates or floor tiles. You can also visit your local tile shop or tile maker and ask them for any broken or unsellable tiles. Online sources are an excellent way to find a large variety of tesserae. Remember to be imaginative! Grout is basically the same as cement apart from the type of sand that is used in higher quality and produces smoother finishes. You can get two types of grout, sanded and smooth. The sanded grout will give you a coarser finish but will work better when the gaps between the tesserae are wide. The smooth grout works better for finer details. Grout comes in all kinds of colors and you can create your own by purchasing white grout and then adding a pigment or acrylic paint. You can buy grout either premixed or dry from a hobby shop or anywhere that sells floor tiles/kitchen tiles. Absolutely anything could inspire you. A walk in the park or city, paintings, television, advertising or a story. Be open to colors and designs as you go about your daily business. There are many historical images of mosaics from the Romans to the Mexican Mayas. Try to make your mosaics original and special to you as this will make them more meaningful and their appeal will last longer. Remember mosaics will last for a very long time so make it worth doing. There are two ways to make mosaics. You can either use the direct grout method or use adhesive and then grout over the top. The direct method is quicker best but has the disadvantage of you not being able to see any pre drawn design on the base. The adhesive method means you can follow a design but you have more cleaning up to do as you lay the grout over the tesserae into the gaps. Before you start, have a design already in your mind or an image as inspiration. After preparing the base you mix the grout and apply it directly to the base in a small area, say the size of your hand. You then push the tesserae directly into the grout forming the pattern or design as you go. Once you have completed the design let it dry and give the tesserae a quick polish and you are finished. Draw out the design onto your base and then apply the tesserae one at a time by putting the adhesive on the tesserae and then attach it to the base. If you have large areas you can lay down a line of adhesive and then stick the tesserae to this. Once the adhesive has thoroughly set, mix the grout and push it into the gaps left between the tesserae using your hand or a spatula. Immediately use a sponge to level of the grout and remove the excess. Clean the tesserae as well as you can, then leave the mosaic to dry. Once dry you can use a damp sponge to clean the tesserae. Using some household polish and lint free cloth, polish until they shine. When using the grout we would recommend the use of old cloths or an apron to protect you as grout stains everything it comes in contact with while wet. Also, old plastic containers, such as cottage cheese tubs, are excellent for mixing small amounts of grout. When you're finished just throw the entire tub of unused grout in the garbage. NEVER, NEVER put the remaining grout down your sink or garbage disposal! Trust us on THIS one! This has been a very brief description of how to do mosaics but everything you need to know is included. As a beginner we would recommend the use of pre-made tesserae and flat board. As you become accustomed to the procedure let your imagination go wild as there are no boundaries to this fascinating and seductive art form. Most importantly, HAVE FUN! ManicForMosaics takes the hassle out of finding & cutting plates for you. We want you to be able to spend your time being creative! However, for our customers who wish to buy & cut plates on their own we are providing this guide to cutting china plates. We think after you realize how much work is involved, you'll have a new appreciation for the quality of our tiles! In our opinion (and that of many other mosaic artists!) 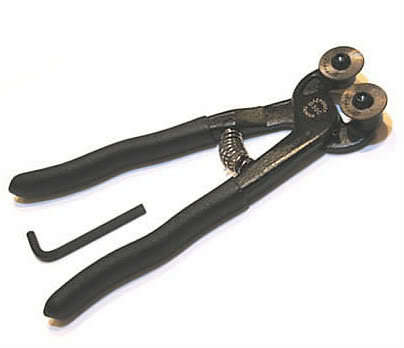 Leponitt two wheeled cutters (also called two wheeled nippers) are the best on the market. Let us give you a few pointers on the cutters themselves. Put the little wrench that comes with your cutter in a safe place so it won't get lost! Sometimes the wheels come loose & you'll need this wrench to tighten them up. Don't over tighten the wheel screws. This can cause the screws to strip or the wheels to crack when you apply pressure. You only need to make them tight - don't TORQUE them down. Also note that the wheels aren't turning as you cut. When the section of the wheel you are cutting with gets dull, all you have to do is to take the small wrench that comes with cutters & loosen the wheels. Use your fingers to turn the blades about a quarter turn & retighten. This gives you a new wheel surface to use. One recommendation is to take a permanent marker & draw a little line on the wheel itself, marking where you first use them to cut. As you use & turn them, you will eventually return to your mark. Then you'll know you've used up that part of the wheels. 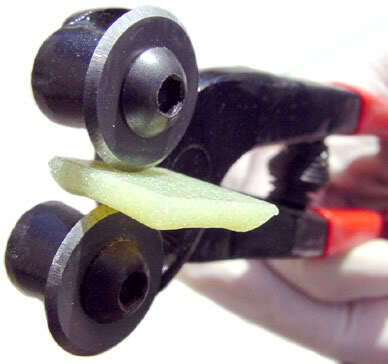 Use the wrench to remove the wheels & turn them over to use the other sides of them. This side won't last as long, but you'll be able to get some usage out of them while you order & wait for your replacement wheels to arrive. Now we'll explain one method on how to cut plates. There are as many ways to cut plates as there are mosaic artists. This is only a suggested guide for someone who wants to begin cutting plates for mosaics. As you get more confident in your plate cutting skills, you may develop a way that works better for you. Our first suggestion is to practice on some very inexpensive plates before you move onto the plates you want to use for your project. As with anything else, practice makes perfect. When cutting plates with a two wheeled cutter, a gentle touch is key! Hold the plate in the opposite hand from your cutting hand. Hold it like you're going to serve cake on it. (We say cake because we LOVE it!) Your thumb should be on the top & the other four fingers underneath the plate. Holding the cutter in your other hand, place the plate between the two wheels of your nipper & gently squeeze the handles until both wheels JUST TOUCH the plate. Then squeeze the handles together & nip. You've made your first cut! If you're not interested in using the center of the plate all you have to do is aim the wheels directly straight across the plate & nip. Then pick up one half of the plate & nip that half. Aim the wheels in the direction you want to cut. Continue nipping each half in half until your tile pieces are the desired size. Try to cut with an eye towards keeping the patterns intact. If you want to save the center of the plate for a focal you'll need to cut the plate a little differently. When you make your first cut, aim the wheels to the right or left at about a 5 o'clock to 2 o'clock area on the plate. Cut rim to rim, not directly across the plate. You may lose a little of the rim design but you'll be able to keep the center design. At some point in cutting off the rims, you may need to cut through the heel (sometimes referred to as a footer) of the plate. The heel is the rim on the underside of a plate that the plate sits on when it is on the table (say, maybe with some CAKE on it!) This is the most difficult part of cutting. If you're going to make a mistake & accidentally cut through your center, this is where you'll probably do it. Even the most experienced plate cutter does this at one time or another! We've cut thousands of plates & watched people cut plates using many different methods & it happens to everyone. Cutting through your plate's center is not always bad. A center focal doesn’t have to be in one piece to be usable! Once the initial heel cut is made continue to cut around the plate, staying close to the inside part of the heel. Cut right up next to the heel & cut away the heel of the plate all the way around. Use small cuts because they can be controlled more easily than large ones. Once the entire heel is removed place your focal on a flat surface. Use a permanent marker & round object slightly smaller in diameter than your center focal to draw a circle on your focal. A drinking glass (or a clear glass jar with a large mouth for bigger focals) works well for this step because you can view the center design through the clear glass. It’s a good idea to draw the circle on the design side of your focal so you can see where the circle will be in relation to the design. The marker will come right off with water or with nail polish remover. Using tiny cuts, follow the marker line & trim away the excess to make a neat edge around the center. Smooth away any rough edges with sandpaper & you're READY TO MOSAIC! !